For rentals of 14 days and longer two Airport Transfers are included. Please note that these free Transfers are only at scheduled times. Our clients will be transferred to the airport, at their own risk, for a fee of N$550.00 for a maximum of 4 persons. Additional persons pay N$90.00 each. Please Note: The Free Transfers (as mentioned above) are only included for all Flights arriving/departing between 05:00am and 17:00pm. Any Transfers before or after the mentioned times will be charged the normal airport transfer rate! It will only be possible to pick up the vehicle the next day for flights arriving on a flight later than 14h20. Please inform us 7 days prior to your arrival the exact date and time of your arrival, including your flight number and the number of persons traveling, so that we can meet you at the airport upon arrival. We will transfer you to our office in Windhoek to pick up your vehicle or take you to your accommodation in Windhoek. Please note that our free shuttle service operates on a fixed time schedule and route. 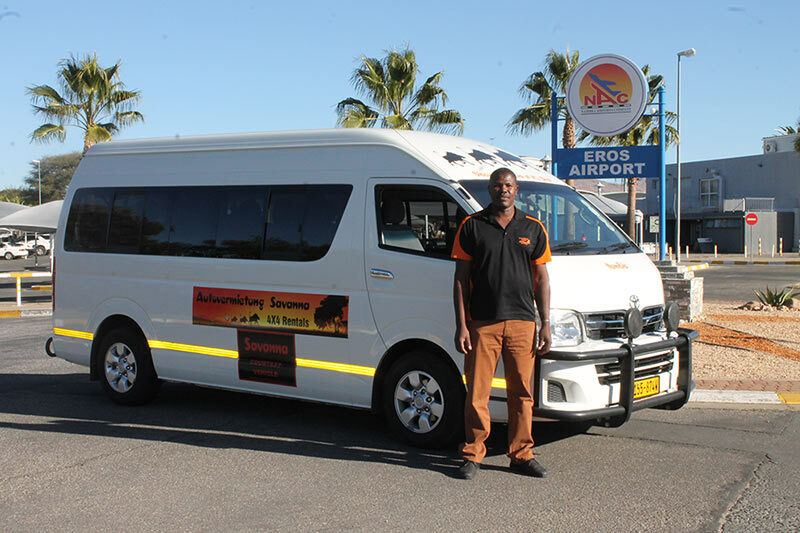 This free service runs from 7h00, (earliest departure from Autovermietung Savanna office) till 16h30 (latest departure from Autovermietung Savanna office). The Airport Company legally forbids vehicle pick-ups and drop-offs at the International Airport. Our driver will wait for you at the airport holding a WELCOME SHEET with the surname/family Name under which the vehicle was booked.Please look out for this Sheet to avoid any confusions and delays. It is also important to inform our driver should you have any lost luggage or delay of any kind. The renter must contact Autovermietung Savanna should any flight be delayed or cancelled. Luggage: We recommend you travel with soft bags to store your luggage. Hard-shell cases may be difficult or even impossible to fit in some vehicles. The suitcases you don’t need on your trip can be stored at our office at your own risk.